Microsoft says it expects to roll out updates to its flagship Edge browser to support U2F later this year. According to a recent article at 9to5Mac.com, Apple has not yet said when or if it will support the standard in its Safari browser. 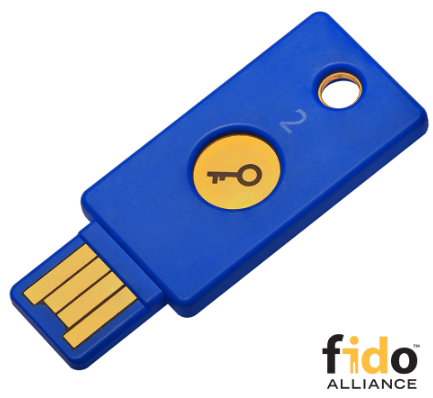 Probably the most popular maker of Security Keys is Yubico, which sells a basic U2F key for $20 (it offers regular USB versions as well as those made for devices that require USB-C connections, such as Apple’s newer Mac OS systems). Yubikey also sells more expensive U2F keys designed to work with mobile devices. If a site you frequent does not yet support WebAuthn, please consider hardening your login with another form of 2FA. Hundreds of sites now support multi-factor authentication. Twofactorauth.org maintains probably the most comprehensive list of which sites support 2FA, indexing each by type of site (email, gaming, finance, etc) and the type of 2FA offered (SMS, phone call, software token, etc.). In general, using SMS and automated phone calls to receive a one-time token is less secure than relying on a software token app like Google Authenticator or Authy. That’s because thieves can intercept that one-time code by tricking your mobile provider into either swapping your mobile device’s SIM card or “porting” your mobile number to a different device. However, if the only 2FA options offered by a site you frequent are SMS and/or phone calls, it is still better than simply relying on a password. While we’re on the subject of multi-factor authentication, I should note that Google now offers an extra set of security measures for all of its properties called Advanced Protection. Exactly how Google’s Advanced Protection works (and the trade-offs involved in turning it on) will likely be the subject of another story here, but Wired.com recently published a decent rundown about it. Incidentally, this article includes a step-by-step guide on how to incorporate Security Keys into Advanced Protection. I have been using Advanced Protection for several months now without any major issues, although it did take me a few tries to get it set up correctly. One frustrating aspect of having it turned on is that it does not allow one to use third-party email applications like Mozilla’s Thunderbird or Outlook. I found this frustrating because as far as I can tell there is no integrated solution in Gmail for PGP/OpenGPG email message encryption, and some readers prefer to share news tips this way. Previously, I had used Thunderbird along with a plugin called Enigmail to do that. This entry was posted on Monday, July 23rd, 2018 at 7:34 am	and is filed under Security Tools. You can follow any comments to this entry through the RSS 2.0 feed. Both comments and pings are currently closed. Have you tried mailvelope for GPG in gmail? A physical security key will also serve very nicely as a digital fingerprint, identifying the individual wherever they go. Nice stealth Internet Drivers License they are shoving at us. They have wanted this form the beginning. I guess 911 has a VERY long tail. Sicherheit uber alles. Nope, U2F keys do not work as a digital fingerprint you can be tracked by. Both the U2F and WebAuthn standards are explicitly designed to prevent exactly that. A new key pair is created for each site you use the security key on, and the key pairs for two different sites are not correlatable. Brian, why are you using Gmail?! For me, Better The Devil You Know Than The Devil You Don’t. Love me some Google devilishness! It seems to be the item I am looking for. I see that you can buy Yubikeys on Amazon … I also see that they are being sold as used devices at a discount. I’m guessing that buying a security device like this used is OK as long as it’s not a knock-off, but I can also think of ways that this might not be a great idea. How easy is it to clone such a device? I love the misdirection. FIDO pushes the attacker from phishing to malware or bypass or some other vector that FIDO fails to address, and (no surprise) that google doesn’t disclose to us. You need to get rid of the bad guys, not just move them to a different attack vector!. Security needs a UX faster, easier, and more convenient than anything people have or use now (or else nobody will use it!). It needs to defend the true breadth of modern threats, with nothing whatsoever out of scope, it needs to address side-channels and tricky bits, like enrollment, loss-handling, social-engineering, friendly-frauds, etc. It needs to work everywhere people need it, which includes over the telephone during calls, as well as in-person. It needs to be globally affordable, privacy respectful, self-service (support free), and to interface with everything people need it for (IoT, no-screen devices, remote equipment, etc) without introducing new risks (e.g. USB/wireless infection/theft vectors). Security Keys do none of that. You’re right, of course. This doesn’t solve all attack vectors. Does that make it not worth doing? Every time I write one of these stories that includes tips on how to lessen the risk from a particular type of attack, we get a flurry of comments from people suggesting the precaution that is the subject of the story won’t stop all attacks. My point is these types of comments only serve to discourage people from taking more responsibility for their own security. On a related note. I can get shot by a pistol through my front window and the airbags are doing nothing to stop it. I’m throwing out these airbags – expensive safety theatre! LOL – remember who else used these gadgets? Mt.Gox. How well did it protect them? Can you explain how the key is more secure than a physical token or mobile token+pin? I understand the risk of the sms based 2 factor, but wouldnt the physical token or software token provide the same level of security? I see a huge difference between saying “eliminated phishing” or “successfully phished” vs “confirmed account takeovers”. Along these same lines any form of 2fa should yield the same results of preventing account takeovers vs stopping/preventing/eliminating phishing as I’ve seen stated in other articles. You can phish the codes generated by a token generator if the user has to type it in. With these tokens the user never has access to the code so they can’t give it to an attacker. All software has issues. Mobile phones are known to have their own attack vectors. Apple forces updates ( to a point ) , Android ( doesn’t ), other “smart phone makers” ???? Thinking of them as “secure” is not only foolish, but dangerous. If a human can “make a mistake” then it will happen. If a physical thing is needed to “get the magic to happen” and that thing only “outputs data” then it is a much harder task to reproduce what that thing would do. Still not completely impossible, but MUCH, MUCH harder to do. To understand that risk you need to get into some serious math that is the foundation for crypto. And I will take those odds or trusting people to do “the right thing all of the time”. You may want to update this with the recent SMS attack on Reddit(?). What happens if someone loses this device? I would not want the mere possession of the token to allow entry. Wouldn’t possession of this token PLUS entering a password be a better security model?